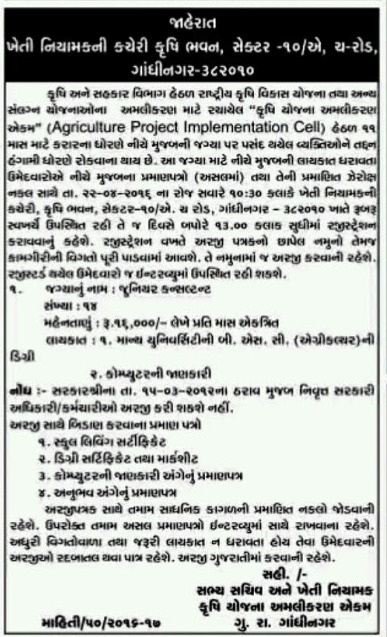 Gujarat Agriculture Project Implementation Cell,Gandhinagar published an advertisement for recruitment for 14 Junior Consultants Posts,more details are mentioned below. Education Qualification : full details of Educational qualification, Age limit, Pay scale, Grade pay ,selection process etc details candidates required to visit official notification which link given below at this vacancy notice. How to Apply? Interested candidates may appear for walk in at the address mentioned in the official notification on the time and date mention below. Venue: Director (Agriculture) Govt. of Gujarat ,Krishi Bhawan, sector 10-A, Gandhinagar- 382010.